Kotka is a city and municipality of Finland.Kotka is located on the coast of the Gulf of Finland at the mouth of Kymi River and it is part of the Kymenlaakso region in southern Finland. Kick off your visit on the 18th (Fri): head off the coast to Varissaari - Fort Elisabeth, then enjoy the sand and surf at Beach Mansikkalahti, and then wander the streets of Linden Esplanade. On your second day here, look for all kinds of wild species at Riverside Park, wander the streets of Stromforsin ruukki, and then step off the mainland to explore Lehman. To find ratings, maps, more things to do, and other tourist information, go to the Kotka vacation maker website . San Antonio, USA to Kotka is an approximately 19-hour flight. Traveling from San Antonio to Kotka, you'll lose 8 hours due to the time zone difference. Plan for much colder temperatures traveling from San Antonio in October, with highs in Kotka at 45°F and lows at 35°F. Wrap up your sightseeing on the 19th (Sat) to allow time to travel to Koli National Park. 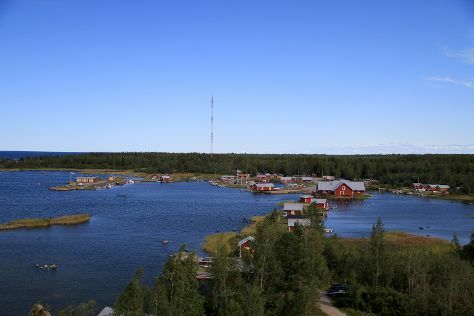 On the 20th (Sun), stop by Koli Shop Retkitupa, then trek along Akka-Koli Hill, and then stroll through Paha-Koli Hill. 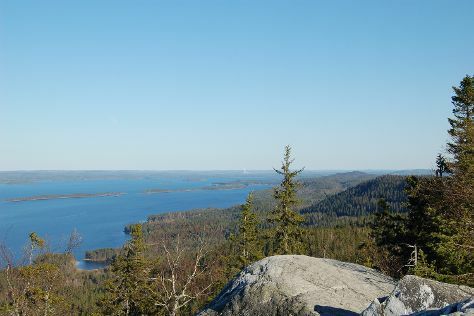 Get ready for a full day of sightseeing on the 21st (Mon): contemplate the waterfront views at Pielinen, hike along Ukko-Koli Hill, then explore the striking landscape at Uhrihalkeama, and finally enjoy breathtaking views from Rasavaara Observation tower. For maps, other places to visit, photos, and more tourist information, read our Koli National Park tour planner. Traveling by car from Kotka to Koli National Park takes 5 hours. Alternatively, you can fly. In October, plan for daily highs up to 42°F, and evening lows to 33°F. Wrap up your sightseeing on the 21st (Mon) early enough to travel to Vaasa. Start off your visit on the 22nd (Tue): head off the coast to Kvarken Archipelago World Heritage Site. Keep things going the next day: examine the collection at Pohjanmaan Museo - Osterbottens Museum, then sample the tasty concoctions at Bock’s Corner Brewery, then pause for some serene contemplation at Mustasaaren kirkko, and finally kick back and relax at Hietasaaren uimaranta. To see where to stay, reviews, photos, and more tourist information, use the Vaasa tour itinerary planner . Traveling by car from Koli National Park to Vaasa takes 6.5 hours. Alternatively, you can fly. In October, daily temperatures in Vaasa can reach 46°F, while at night they dip to 34°F. Cap off your sightseeing on the 23rd (Wed) early enough to catch the train to Tampere. On the 24th (Thu), steep yourself in history at Amuri Museum of Workers' Housing, enjoy the sand and surf at Rauhaniemi Beach, and then tour the pleasant surroundings at Riihiniemen Uimaranta. On the next day, relax and rejuvenate at some of the top local wellness centers, then look for gifts at Tallipihan Suklaapuoti, then take in panoramic vistas at Pyynikki Park and Observation Tower, and finally identify plant and animal life at Hatanpaa Arboretum. To find maps, reviews, traveler tips, and tourist information, read Tampere trip planner . Getting from Vaasa to Tampere by train takes about 2.5 hours. Other options: drive; or take a bus. In October, plan for daily highs up to 45°F, and evening lows to 33°F. Finish your sightseeing early on the 25th (Fri) so you can take a train to Turku. Kick off your visit on the 26th (Sat): take in the spiritual surroundings of Turku Cathedral, then kick back and relax at Ispoinen Beach and Sauna, and then head off the coast to Vepsa Island. Here are some ideas for day two: trek along The Archipelago Trail, then wander the streets of Naantali Old Town, and then browse the collection at Turku City Library. For photos, more things to do, ratings, and other tourist information, use the Turku trip itinerary planner. You can take a train from Tampere to Turku in 2 hours. Other options are to drive; or do a combination of train and flight. In October, daily temperatures in Turku can reach 48°F, while at night they dip to 35°F. Finish up your sightseeing early on the 27th (Sun) so you can go by car to Helsinki. Take a break from Helsinki with a short trip to Nuuksio National Park in Espoo, about 46 minutes away. And it doesn't end there: wander the streets of Katajanokka, contemplate in the serene atmosphere at Kamppi Chapel of Silence, relax and rejuvenate at some of the top local wellness centers, and brush up on your military savvy at Sea Fortress Suomenlinna. 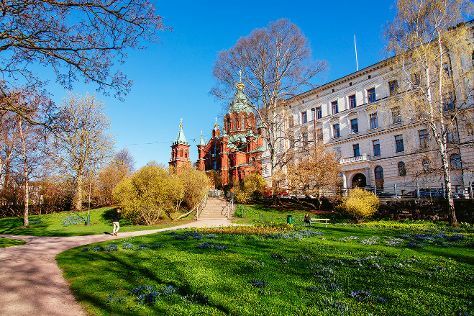 To see photos, where to stay, and other tourist information, use the Helsinki trip itinerary builder app . Traveling by car from Turku to Helsinki takes 2 hours. Alternatively, you can take a train; or fly. Expect a daytime high around 48°F in October, and nighttime lows around 35°F. Wrap up your sightseeing by early afternoon on the 31st (Thu) to allow enough time to travel back home.